The Collection of Architecture was founded in 1986, upon the first purchase of the works of Vojtech Vilhan on 30 April 1986, as part of the Cabinet of Applied Arts and Design. Dr. K. Kubičková, the curator, began to build the architecture collection of the 19th and 20th centuries as a temporary collection for the planned Gallery of Architecture, Applied Arts and Design (Galéria architektúry, úžitkového umenia a dizajnu - GAUUDI) in Bratislava. The collection grew from transfers from other institutions (particularly the Slovak National Museum), acquisitions and donations from the property and estates of architects in Slovakia. In spite of the support of the Ministry of Culture, the mayor of Bratislava, the Association of Slovak Architects (ASA, today's Association of Architects of Slovakia) and the State /Research/ Project and Standardisation Institute in Bratislava, the GAUUDI project was not completed. The designated site of the gallery, the reconstructed palace of Count Qido Karácsonyi (built between 1883 and 1884) became part of the premises of the Presidential Palace after 1989 and thus it acquired a different purpose. Since 1990, GAUUDI had operated as an independent institute of the SNG with K. Kubičková as its chief curator. However, this relative independence was short lived. In 1992, the GAUUDI Institute was closed by SNG director Juraj Žáry and the Collection of Architecture, Applied Arts and Design was created as an integral part of the SNG collections. Further purchases and donations from the estates of architects were added in the 1990s and even sporadic acquisitions and exhibitions were re-established after 2005. 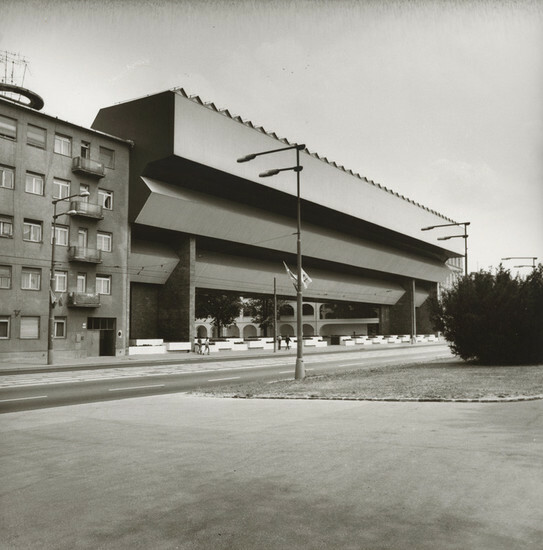 The heterogeneous nature of the collection founded and developed in this way persists even today; the distribution of collectional-archival items between the Collection of Architecture and the SNG Archive partially deals with that. From 1986 to 1992, the collection contained works from the 1970s (V. Vilhan, G. Cimmermannová) and the works of the first generation of modernists in Slovakia, particularly the designs of M. M. Scheer (from 1923 to 1961, acquired in 1987), A. Szonyi and F. Wimmer (individual and joint works from the beginning of the 1930s until 1947, acquired in 1988 and 1990) and O. Winkler (school work from the German Technological University in Prague (1927-33) and the designs from the period of 1936-1938, 1945 and 1951, all acquired in 1987). In 1991, this part of the collection was complemented by Wimmer's personal archive. In addition to family and period photographs, free drawings and aquarelles from 1916 to 1919, it also contains the design of the Mask of the Egyptian, which was created for Wimmer by G. Leweke-Weyde (signed W., undated) for the masquerade ball of Bratislava's Kunstverein art society (1885-1945) in Reduta. It not only indicates the interest of modernists in pre-classical art and the co-influence of individual arts in the creation of a modern lifestyle, but also the carnival upheaval of modernity. Later, the key and most extensive sets of the collection were added, featuring the designs of builder and architect M. M. Harminc and architect M. E. Belluš, a graduate in architecture at the Prague Technical University, the two founders of architecture of the 19th and 20th centuries on the territory of Slovakia. Harminc's set contains all the phases of his work from early historizing and eclectic designs up to late designs with an inclination to the functionalist programme (in which Belluš cooperated at the beginning of his career). Representing the further development and verification of this programme is the continuing and abundant collection of separate designs by academician Belluš, from his early work at the beginning of the 1920s to those from the middle of the 1960s. It contains the author's essential works, implemented and non-implemented, as well as small designs and studies (including stage designs). It provides apicture of how Belluš applied his training in classicizing modernist tradition (under Wágner's student, prof. A. Engl) to various periodic influences: at the beginning, to avant-garde functionalist architecture (K. Honzík, of the Purist Four) and later in the period of socialist realism, even to folk architecture (particularly Renaissance from Spiš Region). The author's typed memoirs are also deposited in the SNG Archive. This collection of works is partially the donation of authors' daughter, Architect M. Janotová, to the Slovak National Gallery and partially acquired through a transfer from the Slovak National Museum. The work of another founding figure, architect D. S. Jurkovič, is represented in the collection by five items (three of which are deposited items). The main part of his work is deposited in the Slovak National Archive in Bratislava. The work of representatives of the founders' generations is followed by selections from the work of J. Štefanec (from 1929 to 1961), F. Čapka (from 1940 to 1980), J. Svetlík (from 1950 to 1985), L. Beisetzer (from 1942 to 1959) and J. Strumayr (from 1940 to 1972). As important as the works of Harminc and Belluš are for the collection, the extensive set of works of modernist town planner E. Hruška, purchased from the author's family in 1990, is also crucial. It contains designs from the school work (undated), through early architectural designs from the 1930s and town planning designs from the 1940s, up to an extensive set of free drawings from the authors' journeys through Slovakia and the world (Paris, Rome, Milan, Venice...). The manuscript of Hruška's book K tvorbe urbanistického priestoru (On the Design of Town Planning Space) with the author's drawings and analytic schemes or diagrams (1983) forms another part of this set. One of the newer acquisitions is the early work of architect L. Foltyn, a Bauhaus graduate. It contains originals and photo documentation of his student work from Bauhaus, as well as the first designs and later manuscripts of his historiography works. The gallery purchased this work from the architect's wife I. Mojžišová, the art historian. Another large acquisition was donated by the author: available designs and archive documentation were donated by architect V. Dedeček, the designer of the key structures of architecture of the 1970s in Slovakia, including the reconstruction and rebuilding on the premises of the SNG from 1963 and 1968-69. The scale of the material captures the author's work from the end of the 1950s until the beginning of the 1990s and includes all his key buildings (University of Agriculture in Nitra, rebuilding of the SNG in Bratislava, Comenius University Campus in Bratislava - Mlynská dolina, University of Forestry and Wood Technology in Zvolen, multipurpose exhibition centre in Bratislava - Petržalka). The youngest generation of Slovak architects included in the collection is represented by our latest acquisition - expansive set of projects, three dimensional models and photographs of implemented projects of architect R. Janák - gained by the gallery as a donation from his wife in the year 2012. It includes early projects of integrated interiors (interior of Cinema Tatra in Bratislava, 1977 - 1979; Supraphon store in Bratislava, 1984 - 1985), separate buildings (M.R. Štefánik Airport Terminal Hall) and reconstruction of historical objects (reconstruction of State Theatre Košice, 1987 - 1994).